Wow – did that summer go by quickly! Schools are starting back up and Autistry is beginning our 4th year. 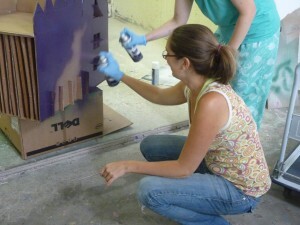 We just posted the 2011 Fall Workshop Schedule. We are very excited about the new Theater Workshop led by our Clinical Director, Liz McDonough. Liz has years of theater experience and is a registered drama therapist. Students in the Theater Workshop will develop characters and scenes and experience different forms of theatrical expression. There will be a performance for friends and family at the end of the semester. All the Autistry students will be lending a hand to build Liz a stage! We are also happy to announce that Courtenay Bell will join us for more workshop fun this year. 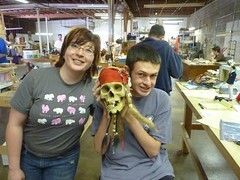 Courtenay will be working with Dan in the Thursday and Friday Build Workshops and with Liz in the new Theater Workshop. She is also planning a Paint with Courtenay Day for sometime in the fall. In addition to her MA in Special Education and her Autism Certification Courtenay has a BFA in Painting from San Francisco Art Institute. She also skates with the Bay Area Derby Girls! 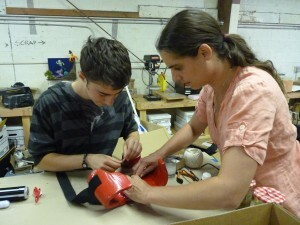 Sara Gardner returns to Autistry as an MFT Intern. Sara is working toward her Counseling Psychology Masters degree at Dominican University. She is an avid gamer and equestrian. 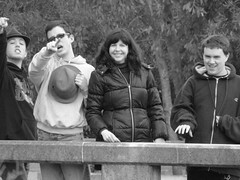 Sara will lead two new groups at Autistry: The Gamers Group and the Sibling Support Group. The Gamers Group is closed but there is still space in the Sibling Group. Email Janet for more information: janet@autistry.com. We also welcome a new face to Autistry: Anna Dow. Anna has been working with us in the Tuesday Build Workshop and will now join us on Saturdays with the Train Group. Anna is in the MFT program at Sonoma State. She graduated from Lesley University with a degree in Ecological Leadership and Education. Anna is originally from Mobile, Alabama. The Autistry Summer Camp (also known as Camp Bear Bait) was a success. All campers returned with no snake bites, no poison oak scratches and no injuries! This was the first Autistry getaway and we are ready to plan some other excursions. A big THANK YOU to the Magnotti/Porter family for hosting the event on their property. The place was amazing – complete with pond and woods. 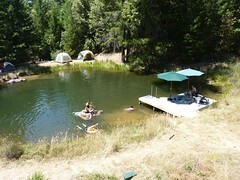 Photos of the camping trip can be found here. We are looking forward to another great year at Autistry Studios!